Antilocapra Americana, the pronghorn antelope, is not really an antelope at all. 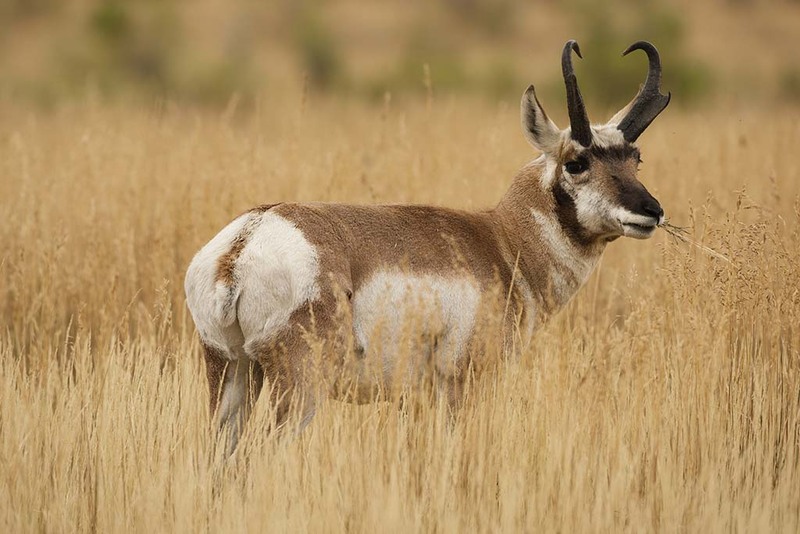 Unlike most North American game animals that crossed onto the continent millennia ago from South America, or across the Bering Land Bridge from Asia, the pronghorn is a true native. It evolved from prehistoric fork-horned ungulates that once called present-day U.S. and Canadian territory home. They're the sole surviving members of the family Antilocapridae. Smaller than the typical whitetail deer, a pronghorn buck will range from 100 to 140 pounds, and is noted for its remarkable speed. They're spread across American and Canadian west, with the largest herd found in Wyoming. Hunted with guns, they're typically pursued spot-and-stalk style, with long-range shots of 400 yards not uncommon. Archery hunters typically either setup with decoys to lure bucks in close during their August rut, or in blinds near waterholes. The Boone & Crocket world record antelope is a tie at 95 inches. Shot first in 2000 in Coconino County, Arizona, the feat was repeated in 2002 in Mohave County. Pronghorn trophies are also prized for more than their size. Some antlers have dramatic heart-shaped curves, revered by many hunters.